The National Center for Education Statistics (NCES) recently launched a new interactive online web portal that will make it easy for researchers, practitioners, and policymakers to build customizable data tables using the PIAAC data. This new tool supplements the information available in NCES’s First Look report—Literacy, Numeracy, and Problem Solving in Technology-Rich Environments Among U.S. Adults: Results From the Program for the Assessment of Adult Competencies 2012—and is designed to enable users to create their own data tables. Like NCES’s First Look report, the PIAAC Results Portal reports average scores and proficiency levels in literacy, numeracy, and problem solving in technology-rich environments. It can be used to compare U.S. performance to the international average and to the average in any or all participating countries. You can also dig a little deeper by examining the data by a variety of characteristics. For example, if you are interested in how U.S. adults with different levels of educational attainment performed in literacy, you can create a table based on educational attainment variables. Likewise, if you are interested in what skills adults use at home and at work and how the use of these skills relates to performance in numeracy, you can look at that as well. There are many other variables to explore. To make your searches easier, NCES has created profiles for key subgroups. For example, the characteristics included in the “unemployed” subgroup profile include age, gender, race/ethnicity, U.S. born, and educational attainment. In addition to these characteristics, the “employed” subgroup profile includes occupation, industry of employment, and level of gross pay. After you have created your customized table, you have the option to export your data table to Excel. You can access the PIAAC Results Portal directly from the PIAAC Gateway homepage: http://piaacgateway.com/. In each issue of The PIAAC Buzz, look for this new section to provide you with all the latest research initiatives, reports, data tools, and resources related to the PIAAC data. And if you haven’t yet done so, join the Research Wiki, a private website designed to encourage collaboration and communication among researchers using the PIAAC data and tools. AIR is pleased to announce the funding of seven research papers on a range of topics based on the PIAAC data. The researchers represent a number of fields, including education, labor economics, health literacy, and sociology. The commissioned papers, funded through a contract with NCES, were selected from among the 18 proposals that AIR received in response to its request for proposals. The papers are intended to broaden the base of research focused on exploration and use of the PIAAC dataset and its analytical tools. Abstracts for each of the accepted research proposals are located here: http://piaacgateway.com/awards-announcement. AIR plans to host an invitational PIAAC research conference in late 2014—the commissioned papers will be presented at this conference and published online by AIR. In April and May, AIR PIAAC hosted three webinars that trained researchers on how to use PIAAC data tools. The first webinar provided a demonstration of how to use the PIAAC Data Explorer, a web-based tool that can produce customized tables and charts using PIAAC data. The second webinar demonstrated how to conduct statistical analyses with PIAAC micro-data using the IEA International Database Analyzer, a free program for using large-scale assessment data with SPSS. The third webinar was another demonstration of the PIAAC Data Explorer, this time for members of the Literacy Funders Network. AIR will be offering more training sessions on the use of the PIAAC data tools over the coming months. Buzz readers will receive notification of training sessions that are open to the public. You can also check www.piaacgateway.com for more information on the PIAAC data tools. If you would like to request a training webinar on behalf of your group, please send an e-mail to piaac@air.org. The higher your skills the higher your wages --- especially in the United States, where there is the largest average increase in hourly wages (28 percent) as a result of a one-standard-deviation increase in numeracy skills. 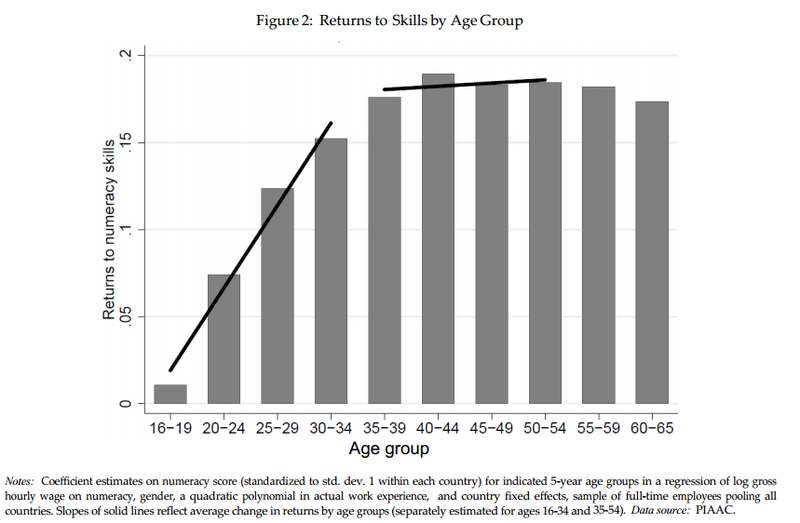 That’s one finding reported in the OECD Working Paper Returns to Skills Around the World: Evidence from PIAAC by Eric Hanushek et al. The link to the report is on the PIAAC Gateway. 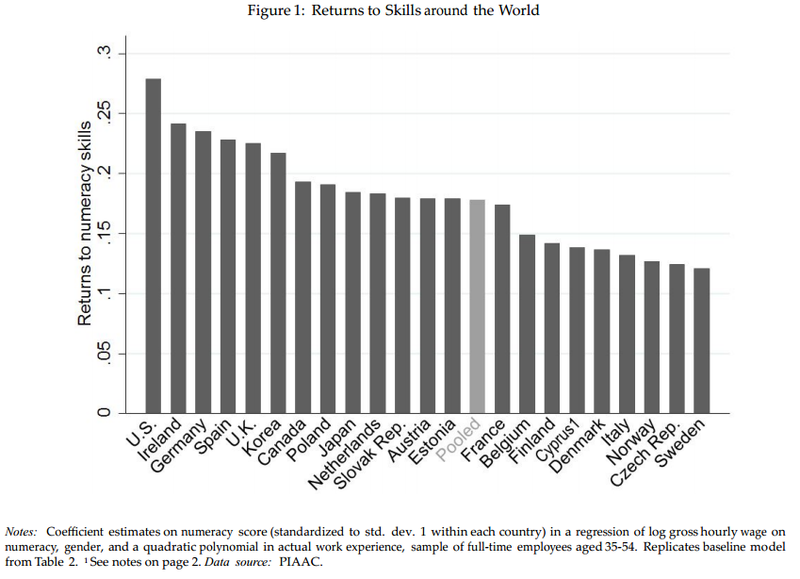 Hanushek and his fellow authors use data from PIAAC to answer the question: “Other things being equal, how do earnings vary with different skills?” Their conclusion: “Higher cognitive skills—measured across numeracy, literacy and problem-solving domains—are systematically related to higher wages” in the 22 participating countries whose data they had access to. We are hoping that future researchers will take up their challenge. The Hanushek et al. paper provides support to the recommendations in the Council for Advancement of Adult Literacy’s recently released report, Invitation to a Roundtable: A Discussion of Return on Investment in Adult Education, by James Parker and Gail Spangenberg. The report, which is based on a roundtable discussion conducted by Parker and Spangenberg with a panel of state and national leaders, focuses on “strategies and insights to help build ROI [return on investment] capacity” in states. The report highlights PIAAC as “a very rich data set that adult education leaders need to be aware of and [which] should be factored into planning and policy making at every level”; it calls on readers to “draw on PIAAC data and analyses as we shape the common taxonomy necessary for messaging and communicating ROI in a way that reflects program purposes, beneficiaries, and outcomes for various groups.” The report is available at http://www.caalusa.org/InvitationtoRoundtable.pdf. If you are looking for a quick summary of the PIAAC results or an up-to-date overview of PIAAC to share at meetings, check out our two newly revised AIR brochures at http://piaacgateway.com/reports/. This brochure summarizes key results from PIAAC, including the performance of various subgroups of U.S. adults, by age, educational attainment, and race/ethnicity. The brochure also describes some of the important issues that data from PIAAC can help shed light on. This brochure provides a broad overview of the PIAAC assessment and its components. There is a new section called “What tools are available to access and share PIAAC results?” that lists the resources about PIAAC that are available, including datasets, presentations, videos, and reports. Who are the low-skilled employed adults? What do we know about the skills of the long-term unemployed? What are the skills of our future workforce in the U.S.? What are the relationships between parents’ education and the skills of their children? If there is some issue of particular concern to you in your work or your community, contact us at piaac@air.org and we’ll see if we can create a toolkit that meets your needs. On February 28, over 70 people attended the Greater Cleveland Literacy Engagement Event sponsored by two Cleveland-area organizations—The Literacy Cooperative and The Center for Community Solutions—as part of the National Engagement Process conducted by the U.S. Department of Education’s Office of Career, Technical and Adult Education (OCTAE) in response to the PIAAC results. At the event, Brenda Dann-Messier, U.S. Assistant Secretary for OCTAE, spoke about the PIAAC findings and the work OCTAE is doing to improve adult skills through its national engagement plan (read more here: http://www.timetoreskill.org). Emily Campbell, Williamson Family Fellow for Applied Research with The Center for Community Solutions, provided a local perspective, calling attention to the 148,000 adults in local counties in the greater Cleveland area who lack a high school degree. Following these presentations, a panel discussed how low literacy affects work at the local level and how to address the challenges raised by low literacy. Members of the panel included Bethia Burke, Director of Grants and Emerging Initiatives for the Fund for Our Economic Future; Victor Ruiz, Executive Director of Esperanza, Inc.; Ron Safier, Chairman of the Board of Directors for the Council of Smaller Enterprises; and Karen Thompson-Shaheen, Chief Program and Operations Officer for NewBridge Cleveland Center for Arts and Technology. Safier and Burke both talked about the need for employers to offer more skills training for employees and build partnerships with postsecondary organizations and adult literacy providers. After the panel discussion, attendees broke into small groups and brainstormed their own suggestions to submit for the national engagement plan. Some suggestions were to incentivize employers to provide on-site literacy programs, highlight local best practices of literacy inclusion, develop a public awareness campaign with a focus on a “call to action,” develop strategies to better transition adults into postsecondary education, and build better connections to subgroups such as ex-offenders, immigrants, and immigrants who are illiterate in their native language. Local media picked up on the event, and it was the subject of an editorial published online by the Plain Dealer: http://www.cleveland.com/opinion/index.ssf/2014/03/northeast_ohio_has_to_work_on.html. Round 2 of PIAAC is currently under way. The countries participating in Round 2 are Chile, Greece, Indonesia, Israel, Lithuania, New Zealand, Singapore, Slovenia, and Turkey—nine countries that did not participate in Round 1. Preparations for Round 2 began in November 2011. The main data collection began in April 2014 and is scheduled to continue until December 2014, with the results expected to be released in May 2016. The assessment in Round 2 will be administered in the same way as the assessment in Round 1, so the results from both rounds will be fully comparable. The OECD expects to add the data for the Round 2 countries to the International Data Explorer (IDE) and the public-use files. Looking beyond Round 2, the OECD is currently examining the possibility of conducting a Round 3 of PIAAC. Representatives from the OECD and interested countries met in March 2014, and if the decision is made to move forward, preparations for Round 3 could begin later in the year. Since the OECD plans to replicate PIAAC every 10 years, the main data collection for a second cycle of PIAAC (including the countries that participated in Round 1) would tentatively be scheduled to take place in 2022. Three of the Round 2 countries—New Zealand, Slovenia, and Turkey—created videos describing why they participated in PIAAC. The videos were shown at the ETS/OECD Research conference in Washington, DC, in November 2013 and can be viewed on the PIAAC Gateway at http://piaacgateway.com/videos/. For an additional video from New Zealand, see https://www.dropbox.com/sh/ezhhuoc9ttzmwzn/Zs6uAqdOkX. Several presentations from one of our first “Planning for PIAAC” outreach sessions were recorded and are available to the public on YouTube. What are some strategies for promoting PIAAC at the local and state levels? This is a question we have been asked by several readers of The PIAAC Buzz. Forward this e-mail to your colleagues and encourage them to sign up for our newsletter. Download and print our informational brochures to learn more about PIAAC and share the printed copies with your colleagues. Post information about PIAAC on the websites, blogs, and discussion lists frequented by your colleagues. Share information about PIAAC with colleagues at conferences or other events. Do you have a plan for PIAAC that you’d like to share with others? Would your organization benefit from a webinar or a guest speaker?